a digest for the modern, multifaceted, millennial wonderparent. The holidays are in full swing, and we are so excited to be in such a giving mood! If there's one thing that I've fully adapted as a main habit after having @LittleMrGray, it's been the preference to shop small, or at least from businesses that are not the usual child-brand giants. For things such as toys, and even clothes; I've found myself preferring goods from the smaller to medium-sized guys rather than the toy giants a la Mattel, V-Tech, Fisher-Price etc. Not to say that there's anything wrong with these companies, but with Grayson for example - in an era where I'm trying to steer clear from as many digital toys as I can (for as long as I can), I find that these companies cater more to these type of instantly-gratifying toys than Montessori-style toys that leave more to the imagination. Also, I find that the smaller companies are much more transparent with their overall missions and interest in providing the best for your child. Under The Nile is an amazing brand that I love and adore. The family-own business produces all of their garments with some of the best certified organic cotton on the market. Quality considered, it is relatively affordable and also 100% GOTS Certified. To add to the good - the brand is also genuinely committed to ethical production, including making sure their employees receive a living wage, education, and health care. You can find their items by clicking here. The discussion of toxic-free clothing is one I hadn't given thought to prior to becoming a mom but it's certainly important. Majority of companies create clothing garments for children and adults alike that is produced with non-organic cotton which is heavily treated with pesticides, herbicides, and chemical fertilizers. This in turn, not only presents a nasty threat to the wearer (i.e. : you and your baby) but also a big long-term threat to those workers picking the crops, handling the clothes, and those living near the crops as well (these nasty pesticides usually seep into local water sources which are then easily consumed or used). Although toxins used to harvest the fiber are almost usually washed out in the processing of the garment, it's still best bet to always was your clothes before a first wear. With children, and babies especially; they're more vulnerable to the harmful effects of pesticides and toxins when in direct contact, and of course there's the threat of ADHD development which has been linked credibly, numerous times. Chemicals used to produce "wrinkle-resistance, stain-resistance, static-resistance, etc) - usually produced with Formaldehyde which is a widely known carcinogen. Lots of popular baby clothing brands have been shown to contain amounts with concentrations as high as 18,000 ppm (parts per million), when the "safe range" is actually 20 ppm. A common short-term reaction to the effects of Formaldehyde: contact allergic dermatitis, or what the average parent would seem to diagnose as just a bad rash - but still a big indicator of just how quickly impacting these amounts can be on your baby. Thankfully however, the dangers of formaldehyde are taking notice in the big offices - click here to see a list of cities and states that are actually banning the use of it, specifically in baby products. Other nasty agents like Perfluorochemicals (PFC's) which is a stain-repellent (i.e. : Gore-Tex and Scotchguard) is a nasty blood containment, Nonylphenol ethoxylates (NPEs) is a surfactant that ends up in your water supply once clothes are washed, and Phthalates - the uber harmful chemical plasticizer which is often found in clothing dyes, embellishments and plastisol prints. Between birth and the end of the first year, babies are destined for the floor! Tummy time, crawl time and toy time are all best on the floor and a great playmat and cushion make the perfect gift to encourage it! I love these animal mats and cushions from Mister Fly, an Australian based company that designs stylish yet practical products in gender neutral palettes which are all produced to be essentials for babies! Although Mister Fly is an Aussie brand you can however get it stateside at one of my favorite small-business websites: Purely Loved Organics. The mat pictured is $86.00 and the cushion is $35.00. Babies can begin teething as early as 3-months old, and the 6-month mark is usually the sweet spot and height for teething discomfort so a safe and natural teether is essential! Considering this is something a baby will grab for to put in their mouth for endless amounts of time, it's important to seek a teething toy that won't pose any harm. By harm, I mean teethers made from bad materials, with chemicals, and carcinogens. Teethers made in China have been known to contain lead (by way of their paint) and have their plastic materials contain phthalates. Those teethers that can be frozen or chilled are made of polyvinyl chloride (PVC), which is a plastic that is softened with phthalates. 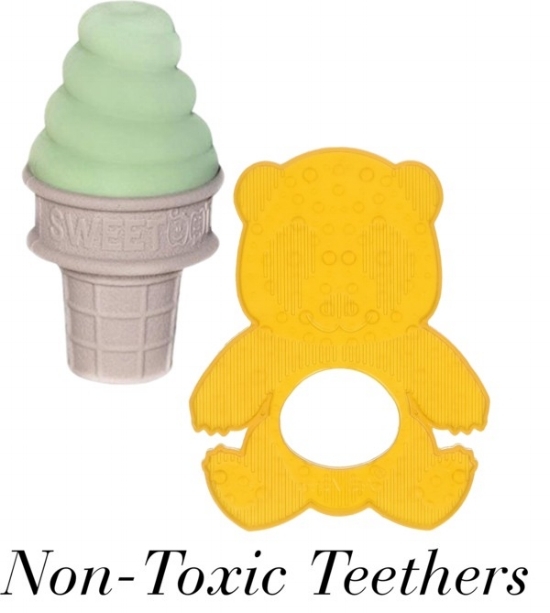 Plastic teethers of any kind, I completely suggest avoiding...even if they say BPA and phthalate-free, they're still made with BPA and phthalate simulant fillers which in turn can still be toxic and hormone distrupting. Lastly teething biscuits and wafers can inadvertently become a choke hazard as they can break inside a baby's moth, so only administer these under supervision. Both the Hevea and Sweettooth teethers were my absolute faves with @LittleMrGray. The Hevea Natural Teether, $14.00 @ Amazon; is made of all-natural rubber, contains no dyes, plastics and no harsh chemicals or binders. The natural rubber is sustainably sourced and it is free from phtalates, colors, PVC, evatane, and BPA. The malleable rubber encourages baby's natural gnawing action and the gentle texture surface encourages soothing. It works great at massaging irritated gums, is super easy to grip, hygenic, and a seamless one-piece design that prevents bacteria accumulating in cracks and joints. Even the packaging is made from recycled and biodegradable materials and printed in soy ink. I loveeee Melissa & Doug toys! It's one of those credible companies that's known but not an overwhelming toy giant, that puts so much thought into their toys and reinforces the basics in cognitive development. Most of their toys are made of sustainable wood and all of their toys are made in the USA and contain toxic and lead-free paints and dyes. Their shape sorter is a true staple toy and a classic that every baby, generations in and out should have. Gifting a shape sorter to a baby at this stage is perfect as this is when they begin exploring coordination, grabbing and tapping into problem-solving skills. You can purchase the Melissa & Doug Sorting Cube on Amazon for around $11.00. Hape is also a favorite toy company of mine. Just like Melissa & Doug, their wooden toys are designed to promote cognitive and physical development for babies, and are made of amazing sustainable and socially responsible materials. Hape is the largest wooden toy producer in the world with some of the highest and strictest design standards in place. The German brand ensures that their toys are developed to enhance a child’s developmental skills. Neither language, nor culture, nor gender impedes the intuitive play patterns. A perfect match for a mom like me who is raising a bilingual baby! The Walk-A-Long Caterpillar is awesome for tots that are mobilizing, and can be purchased on Amazon for around $20.00. Once babies get mobile and start pulling up (our little one began at 6.5 months!) it's time to encourage standing and walking. Melissa & Doug makes this awesome push toy that I love. It's made of wood and has alligators that "chomp" as you push them. It's a great size for standing babies, and is sturdy enough for them to safely grab, push and walk with. This one can be purchased at Amazon, currently for $34.99. Once those babies start walking they want to get into everything! Mobility is at an all time high, and it becomes a great time to let them safely explore all of the fun ways they can get around! I love this Hape Scoot Around Wooden Balance Bike because it's safe enough to accommodate a tot with large enough wheels that provide the even balance needed so that they don't tip over. The stylish bike can be currently purchased on Amazon for $59.99. A second fun option for the luxury modish parent is this super cute Mercedes-Benz Ride On Push Car in Matte Black. This is a simple ride-on car with no electronic controls that allows your tot to scoot around using their feet as pedals to the floor. Aside from it being uber stylish, it's also not as space-consuming as other ride on toys! It can currently be purchased on Amazon for $60.00. Building blocks are always an amazing item toy for toddlers. It expands their creative and coordination skills and allows them to create and rebuild on a whim. There are so many sets and kinds on the market from some of my favorite toy brands but one of my preferred "starter" sets if you would say, are for sure the Melissa & Dough ABC/123 Building Block Sets. Aside from being wood, I love that these have numbers, letters and matching shapes on each block so that not only are you getting a creative toy but you're also getting to teach your little ones visual recognition and memorization of their alphabet and numbers! Melissa & Doug's ABC/123 Building Block Set will run you about $11.00 on Amazon! There's a reason why these contraptions have been around for generations on end! You walk into any pediatrician's office or day care and boom, there they are! Activity centers are FUN and a great way to help your tot explore and keep busy with all of their different areas of exploration. The Manhattan Toy Company's Tree Top center includes four fun sides of mazes, wire runs, animal illustrations, abacus', and more! Check it out on Amazon for $69.99! I spoke about the importance of imaginary play in this post, and ages 3-5 is the absolute perfect time to heighten this routine! Melissa & Doug make these awesome costumes which come in such a nice variety for your preschooler; which I'm sure every parent and kid-alike will just love. Whether they want to be a doctor, a construction worker, or a fire(wo)man; Melissa & Doug's pretend play team has you completely covered! Check out the variety here...they all range between $20-30 on Amazon. This unique and amazing book has left quite the impression since launching in 2016. 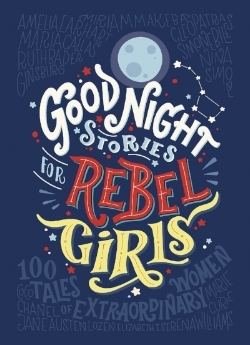 It's an awesome collection of a 100 illustrated short stories that celebrate extraordinary women in history. Not just for girls, it's also a great read for boys too! Plus since there's way more than just 100-bad-a$$ women to write about, volume 2 is also out now! Tap Into Problem-Solving: Scientific Explorer Crime Catchers Spy Science Kit, $22 @ Amazon. This really cool science set allows your kids to solve two mysteries and comes with eight additional activities. Allow them to work solo or in pairs as they decode secret messages, match fingerprints; test powders, liquids and more! Let Your Inner Artist Shine: Crayola Inspiration Art Case: 140 Pieces, Art Set, Gifts for Kids and Adults, $24.99 @ Amazon. Who doesn't love Crayola? Well, they have this amazing, super-loaded 140-piece art set that comes complete with all of the crayons, markers, and color pencils that you could dream of! It's truly the perfect gift for the creative and artsy kid that's looking for an organized way to keep their materials! Not just for kids however, this is also a really fun buy for creative adults too! Well, we hope we sparked some ideas in your last minute gift shopping scramble! Don't forget that Amazon offers overnight delivery and free two-day delivery in most cases to Prime members! Whatever you get, we hope that you have an amazing holiday with your loved ones and remember that nothing will make a child (or any human) light up more than complete love! Happy Holidays! Grayson's Aveeno Campaign is Finally Here!